I’ve already mentioned that I come from a rather large extended family on my Dad’s side. His Dad, my Grandpa, was one of 4 children, the only son with three sisters – that in itself isn’t a large family, but over the generations, and once they all had kids, and their kids had kids, there were always wonderfully large gatherings at my Granny and Grandpa’s home most Sundays. And as everyone grew up and went their separate ways, it became a family tradition to have a get together on the first Sunday of every month and each family would bring along a finger food, be it savoury or sweet. The table would almost be groaning under the weight and variety on offer, with one of my favourites being my Great Aunt’s milk tart. 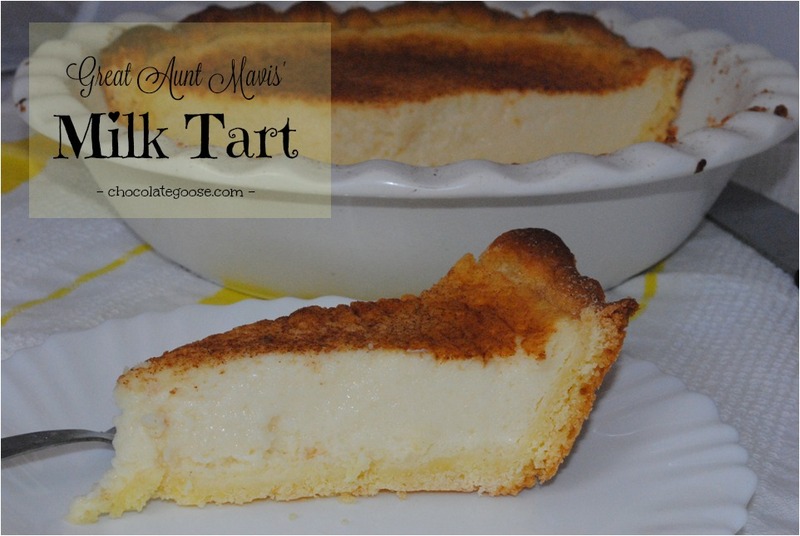 Melk Tert (or Milk Tart), is literally the Afrikaans translation meaning a tart made out of milk and can trace it’s origins back to the Dutch settlers who landed at the Cape of Good Hope in the 1600’s. So it’s been a traditional South African recipe for many, many generations. Now anyone who knows about egg custards, knows that they are pretty simple to make, but you still have to be careful as no-one wants scrambled egg in their custard. The egg needs to be cooked slowly and delicately with no stringy lumps forming. Between the egg and the pastry, this tart has always been my nemesis. I can’t tell you how many recipes I’ve tried over the years, but my lovely cousin Jenny (2nd or third cousin actually!) shared her Beloved Mum’s recipe with me and it is one I’ll treasure forever. Jenny scanned the original hand-written recipe and emailed it to me to show the beautiful slanted cursive handwriting of yester-year written by Great Aunty Hilda, Mavis’ sister. Aunty Mavis always had the most beautiful skin, was ready with a cuddle, always had a tissue handy and had one of the most wonderfully infectious laughs – and boy could she bake. She was an amazingly talented cake decorator, making beautiful sugar craft decorations and roses years before it became fashionable and she kindly baked and decorated my 21st birthday cake too. Happy memories. Oh, and she could crochet beautifully too! So sad when you look back and realise that you should have spent more time learning from the wiser generations before they moved on. But back to this recipe. It has become the only one I make now and works perfectly every time. The quanity as noted below, is sufficient to make two smaller round tarts or 1 fairly large one. It can also be made in a square tart/flan dish and cut into squares once cooled. The secret of this wonderfully light mixture is to separate the eggs, beating the whites until they are thick and stiff before folding them into the cooked egg yolk/custard mixture. Not all milk tart recipes call for this, but I guarantee it makes for a lighter filling. I pre-cook the pastry for a few minutes, baking blind using baking beans spread evenly over the pastry on a sheet of baking paper, substitute the baking beans with uncooked rice or beans and then just discard them once done. The paper is then lifted off mid way through cooking the pastry so it holds it’s shape during the remaining cooking time. The custard is then added and the tart it put back into the oven to cook. The first time I made it, I was a little nervous as it rises quite a bit, but once removed from the oven, it sinks back to form a flat top which you cover with a sprinkling of cinnamon. Add a little sugar too to give it an extra sparkle if you like, but the traditional way is plain ground cinnamon sprinkled on the top. Thank you Jenny, for sharing, and thank you Aunty Mavis. For ease of use I have used ready-made sweet short crust pastry. Preheat the oven to 220°C. Line a pie dish with the thinly rolled out pastry. Return it to the fridge for about 10 minutes. Meanwhile, place the milk and cinnamon stick into a saucepan and bring gently to a simmer on the stove.Now here’s where I differ slightly to my Aunt’s recipe – I like to pre-cook the pastry a little before adding the milk mixture as I’m still a little nervous of serving up an uncooked pie shell – not good. Place a sheet of baking paper into the pie shell, taking care to remove any air bubbles and cover with the baking beans, rice or dry beans. Place into the heated oven and cook for 5 – 7 minutes. Remove from the oven and carefully remove the baking parchment and beans without burning yourself. While the pastry is in the oven, mix the flour, cornflour and sugar with a little of the warmed milk to form a thick liquid paste and pour it into the simmering milk. Boil for 3 minutes, stirring constantly so it doesn’t catch on the bottom. Once thickened, remove from the stove. In two separate bowls, separate the egg whites and yolks. Add a little of the warmed milk mixture to the yolks and butter to bring the eggs to temperature before adding the egg mixture to the saucepan. Stir through until the butter is melted and the egg completely combined. Beat the egg white in a large bowl until the stiff peak stage – my son had a good laugh when I held the bowl above my head and went Ta-Da! He clearly thought I’d have the egg landing on my head, but it was just the perfect consistency and didn’t move – thankfully. Again, add a little of the warmed milk mixture to the egg whites and fold gently. This brings the egg to temperature without cooking it too quickly. Then spoon the egg whites into the saucepan and fold through. Don’t stir, you want to keep as much of the air in as possible. Once combined, pour into the prepared pastry shell. Pour the mixture into the par-cooked pie shell and return to the oven, reducing the heat to 200°C. Cook for a further 10 – 15 minutes until the tart is still slightly wobbly but cooked through. The filling will have risen slightly, but it will relax on cooling. Allow to cool and sprinkle with ground cinnamon or a cinnamon sugar mixture. Some people like to serve it hot/warm but I prefer it cooled right down.